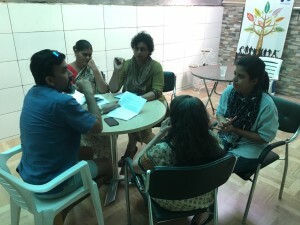 Samvedna Senior Care was established in October 2013 with two complementary goals – firstly to provide quality home care services to seniors with limited mobility or dementia and hence social interaction, and secondly to facilitate stimulating community interaction and participation. Know more about our Trained Attendant Services here http://www.samvednacare.com/attendant-care-services. You can also call us on 98184 00561 or write to us on contact@samvednacare.com. From initial stage to advanced stage, all individuals with dementia feel the need for social interaction at times. Our Dementia Cafe is a safe and friendly place for your loved one with dementia to chill and socialize. The cafe is aplace where they will find a fun activity, a warm chair and companionship. Every Tuesday and Thursday, 11-1PM. 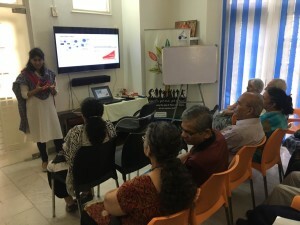 Samvedna’s Cognitive Wellness Programme is designed for seniors with mild cognitive impairment, early dementia or Parkinson’s,and elderly lacking in enthusiasm and motivation. The aim is to stimulate the mind of the elderly to slow the progression of the disease or impairment. The sessions are 3 days a week – Monday, Wednesday and Friday, 11AM-1PM. Our Dementia Support group in Delhi NCR and Guwahati is a platform for caregivers to share feelings and support each other.